The purpose of this research was to investigate the viability of partnerships between instructional technology and teacher education faculty in order to promote technology integration in content methods courses. This study also focused on preservice teachers' evolving perception of technology integration through participation in targeted technology integration workshops, led by area classroom teachers, school librarians and teacher education faculty. This mixed methods case study was conducted over the course of three semesters at a large university located in the southeastern region of the United States. Results of quantitative and qualitative data indicate that co-teaching and technology integration activities should be implemented at a high frequency if preservice teachers’ perceptions and understandings are to be significantly impacted. Data also suggests that the technology integration workshop is a promising alternative structure for preservice teacher technology integration when co-teaching is not a viable option. Green, L., Chassereau, K., Kennedy, K. & Schriver, M. (2013). Where Technology and Science Collide: A Co-Teaching Experience Between Middle Grades Science Methods and Instructional Technology Faculty. 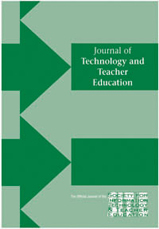 Journal of Technology and Teacher Education, 21 (4), 385-408. Waynesville, NC USA: Society for Information Technology & Teacher Education. Retrieved April 21, 2019 from https://www.learntechlib.org/primary/p/42116/.